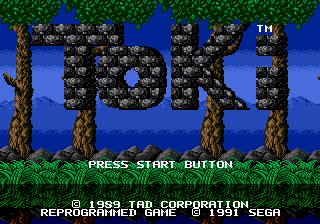 Toki: Going Ape Spit, called JuJu Densetsu (ＪｕＪｕ伝説) in Japan, is an update to the arcade game Toki, and was released for the Sega Mega Drive in 1992. Though it retains the original story, gameplay rules and music as the original arcade release, there are now more levels. “ Dr. Stark, the evil genetic engineer, kidnaps your girlfriend then turns you into an ape. You've got to find her before it's too late. Open your mouth and let it fly! Scorch Stark's weird hordes with fireballs and laser blasts. Slog through disgusting ooze bogs, explore lush jungles, jump boiling lava pits, and swim beneath sparkling seas. Go wild! Score a super simian success on your way through this fantastic adventure. In the game the player guides a man named Toki turned into a spitting monkey who must save the princess Miho from the evil witch doctor Vookimedlo. The player must travel through various 2D worlds, defeating enemies by spitting at them or jumping on their heads, while avoiding obstacles. The game uses a two-button control setup, one for jumping, one for shooting. Toki can fire straight and diagonally. The shot can be enhanced by powerups, but their effect isn't persisting. The arcade original's helmet is replaced by a star pickup. Shoes that increase walking speed and jump height can also be found. Pushing down makes Toki crawl. Taking a hit results in instant death, with no checkpoints available. Play as Level 8-3: Enter the Options screen and switch the controls to and for Fire and for Jump. Return to the title screen wait for the demos to begin. Watch the demos until you see an extremely dark level. The demo will run for a while and then pause. Press Start to unpause and enter the game. You will die and begin at the Volcano level. Keep spitting to light up the place, otherwise it will be totally dark. Independent developer Golgoth Studio announced to develop a remake of the arcade version to feature high definition hand-drawn graphics and new ambient sounds. But never released. The original arcade version, including other ports, had less detailed graphics and less levels, though it did have additional power-ups, including a defensive American Football helmet. The original was roughly 20 minutes long, the Sega Mega Drive version is about 60 minutes long. Only the title screen graphics are different between the Japanese and the western release, The game has no region lock and all versions are included in the rom file. The Sega Mega Drive version has much darker colors and less saturated colors than the arcade release. This seems to have been done by choice rather than by palette restrictions. Stage 1 seems to miss a raster scroll effect. Bushes and trees are reflected in the water, but the ripple effect (as seen on the title screen) is missing. Stage 6 features a heavy flashing effect. In the original, the tips of the crystals in the background would blink slightly brighter, on the Sega Mega Drive , the whole background flashes in strong white. Main article: Toki: Going Ape Spit/Magazine articles.